Interesting atomic pull I must admit wasn't 100% sure it would work the 1st time I tried it. The shininess of the block v3 is just for looks. It does not extend internally so it is no harder or slippier inside. Although it can make nozzle cleanup easier I have noticed. Not that I care about that. The block v3 has significantly better contact between block and nozzle. Carl says 40% better heat transfer to nozzle. And less contact between block and steel isolator. This is done by increasing (and decreasing) threads, adding a chamfer (right word?) around the base of the cylinder that holds the nozzle where the cylinder attaches to the block and adding a chamfer to both the nozzle and block that fit together perfectly (this had caused those early leaks but is fixed now - as far as I know you don't need extra torque to stop leaks anymore). I did some max-possible extrusion rate tests and the block v3 with the race nozzles were faster than the olsson with regular nozzles. My tests didn't seem the same improvements that Carl saw but they were very significant - I forget right now but it wasn't like 10% faster it was more like twice as fast at the same temperature. But faster isn't always better. However I *suspect* (not sure) that because I could print cooler without speeding up the print then that probably (not sure) increases quality of print. I really don't have much emotional investment into the block v3 or the matchless products (sorry Carl) so I haven't done a lot of testing. I do use the product on one of my 5 printers and it works great. It's probably the printer I use the most. It certainly seems to sell well. Everyone likes shiny. Well not everyone. The extrusion test where done on a olsson block just with the matchless nozzles or the test where olsson+normalnozzle/v3+matchlessnozzle? I also found the bondtech to be about the same as the UM2 plus feeder. But the plus versus bondtech were done on 2 different printers with different bowdens and teflon and such (bowdens and teflon wear down) and 2 different temp sensors. No one else seems to test the way I do but I think my method is much better. I print solid cubes with no shell and 100% infill and look at the traces to see if there is slight underextrusion - you can see the gaps between the infill lines. If I see even just 10% underextrusion I call that a fail and slow down. So my top speeds are MUCH SLOWER than what most people see in their tests. I mean a 20% underextruded print actually looks pretty good except the top layers have holes. So around 20-25% more mm3 under controlled test. I would be more interested on how much cooler it could print vs the other, rather than mm3. Also it could be nice to see prints from one to the other on the same conditions to see if it need much tunning to print (if one leaks more/less). Anyway, interesting for users that need to print large stuff. For pla that amount of material could be an issue since the um2 fans are quite weak. gr5 wrote: So my top speeds are MUCH SLOWER than what most people see in their tests. I mean a 20% underextruded print actually looks pretty good except the top layers have holes. Offtopic, but I have made similar observations. Underextrusion up to about 10% can hardly be seen. Parts look good, all or most of the surfaces are closed and the parts are relatively strong. Even with up to 25% underextrusion parts look good, you have to look close to the top surfaces to see the underextrusion (walls do not touch, holes in the top layers). Layerbonding and strength of the parts suffer. With other words: Many people are printing with too high extrusion rates (mm³) without noticing it. You often see this underextrusion effects in uploaded pictures of printed objects. As you say, this makes it hard to compare results. The effective output of the feeder/nozzle should be compared, and not the flowrate that is dictated by gcode (since it is affected by 'feeder slip'). Indeed most people don't see that 10%. I do because I print a lot of stuff over and over and to print fast with as much quality as possible I need to have everything tune up to get good repetition on 3 different machines. I'm quite obsessed with all the details and I try to maintain every aspect under as much control as possible. Basically to print one random object almost everything is ok, but to make 1000 of the same fast and with quality you need to tune everything on the machine and on the slicer. Also, when you have all tune up you can do a perfect top layer with just 3 top layers (I can do 2 but for physical strength I go with 3). In the end it all depends on how much quality you want to get from a fdm, and try to squish every single bit of quality without compromising speed. So I'm hoping Anders is still checking this thread. It looks like he is. I was pretty interested in this nozzle when it popped up on the 3dprinting reddit. I'm running a Makergear M2 with it's standard hot end, and I was hoping I could adapt one of these to that hot end. Except the M2 nozzles have an M6 internal thread. Which isn't likely to work well with a nozzle that tightens with a 7mm wrench, heh. So now I'm wondering if Anders would be willing to look at making an M2 compatible nozzle at some point or if he'd part with one or two of the rubys themselves so I could do some development work. I don't think there are plans for a Makergear M2 ruby nozzle at the moment, however it should be possible to make one if there is a demand. 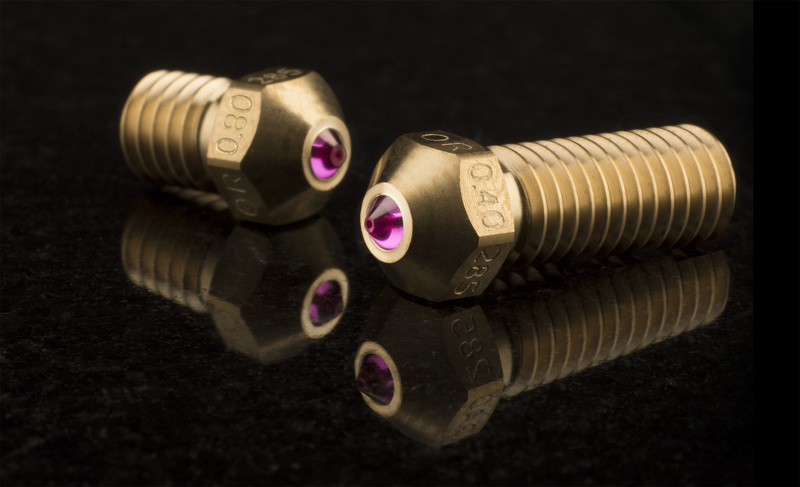 The ruby nozzles currently available have an external M6 thread though (the key size is not dependent on the thread size, in fact 10 mm key is standard for M6 machine screws). So, I am just thinking, if you made an internally threaded tube that is ~10mm long you should be able to screw that onto the Makergear hotend to convert it to accept Olsson/E3D-nozzles? Of course, you have to wait for 1.75 mm ruby nozzles to become available, but that would be the quickest solution I believe? Anders, you can add PETG/Carbon from NANOVIA TECHNOLOGIES filament for the compatibility with the ruby nozzle. Today we announced new sizes (0.6 and 0.8mm) available now, and upcoming versions of the #olssonruby to fit the Volcano from E3D and the MOARstruder from LulzBot. Nice! 3dsolex also has multiple sizes of ruby/sapphire nozzles: 0.25 0.4 0.6 0.8 1.2 for both e3dv6 (UMO,UM2) style and for UM3 nozzles. Would that nozzle on the right in the photo above fit in a UM3 core? I'm not sure .25mm ruby makes sense though.